> Uncategorized > Alan Blumlein, grandson of inventor and war hero Alan Dower Blumlein today honours his grandfather on his 114 birthday. 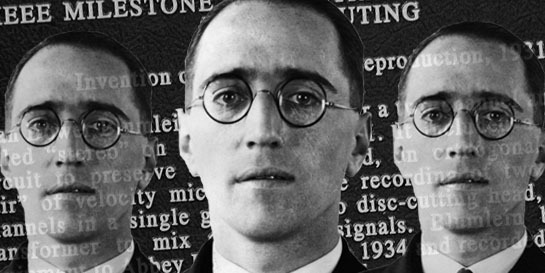 My Grandfather, the genius electronics engineer and inventor Alan Dower Blumlein was born on this day, June 29th, 1903. Employed by EMI at the Hayes R&D facility for most of his working life, he filed 128 patents in the field of telecommunications, stereo sound, television and H2S airborne radar. Sadly, his life was cut tragically short at the age of 38, when he and other key EMI scientists were killed in plane crash while testing H2S airborne radar on June 7th, 1942. Alan Dower Blumlein is best known for his invention of stereo which, incredibly, he filed the first patent for in 1931 when he was just 27 years old. Patent number 394.325 covered the microphone techniques necessary to record in stereo, the electronic circuitry to reproduce stereo sound through loudspeakers and the cutting system to record stereo wax masters ready for pressing records. In 1934 at the legendary Abbey Road Studios, he made live stereo recordings of Sir Thomas Beecham conducting the London Philharmonic Orchestra playing Mozart’s Jupiter Symphony directly to stereo wax masters. The EMI Hayes R&D facility would prove instrumental to so much of his work and also provided the stage for one of the few videos of stereo testing – the famous ‘Walking and Talking’ video. To this day, recognition of my Grandfather’s work has been sporadic outside the audio recording industry. However, in 1977 the London GLC mounted a blue plaque on the last house that he lived in at 37 The Ridings in Ealing, London. In 2008, a building at RAF Defford was named the “Alan Blumlein Building” by Princess Anne. RAF Defford is where he and the EMI team took off on June 7th, 1942 to test H2S radar, never to return. In 2013, the Blumlein family starting working with the Institute of Electrical and Electronics Engineers (IEEE) to gain an IEEE Milestone Award for the invention of Stereo. On April 1st, 2015 an event was held at Abbey Road Studios, in the famous Studio 2, to celebrate the Milestone Award. A plaque now sits outside the entrance of Abbey Road Studios to commemorate the invention of stereo and the historical link to Abbey Road Studios. Following the IEEE Milestone Award and event at Abbey Road Studios, recognition of Alan Dower Blumlein’s achievements has increased. His invention of stereo and contributions of outstanding technical significance to the recording field has now been honored by The Recording Academy with a posthumous Technical GRAMMY®. The 2017 Technical GRAMMY® will be awarded to Alan Dower Blumlein,to be received by members of the Blumlein family in New York City on July 11th, 2017. Alan Dower Blumlein was one of the greatest electronics engineers ever to have lived, contributing not just to the world of audio but to early telecommunications, the television system adopted by the BBC in 1936 and, during World War II, in the development of the crucial H2S Airborne Radar system that contributed greatly in Britain winning the war. Alan’s memory continues through recognition of his incredible life and achievements. His life and works is currently being developed into an as-yet untitled film project by Universal Music Group, which owns Abbey Road Studios and also supports and maintains The EMI Group Archive Trust – home to much of Alan’s work, inventions and artefacts in their purpose built historical archive in Hayes, Middlesex, UK.